The first Pathways to the Professoriate cohort pose for a group photo at the program's kick-off event at the Orange Grove Bistro. Photo by David Hawkins. 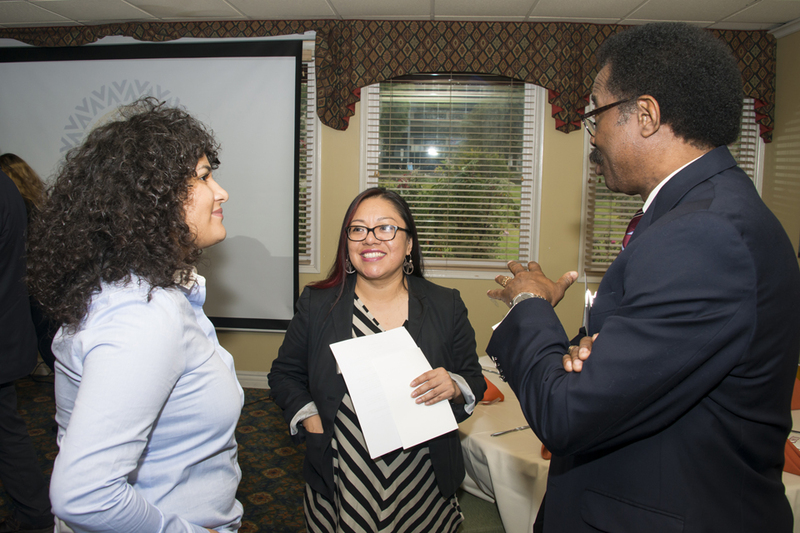 CSUN student and mentee Yaquelin Morales speaks with her mentor Xochitl Flores-Marcial and Vice President of Student Affairs and Dean of Students William Watkins. Photo by David Hawkins. 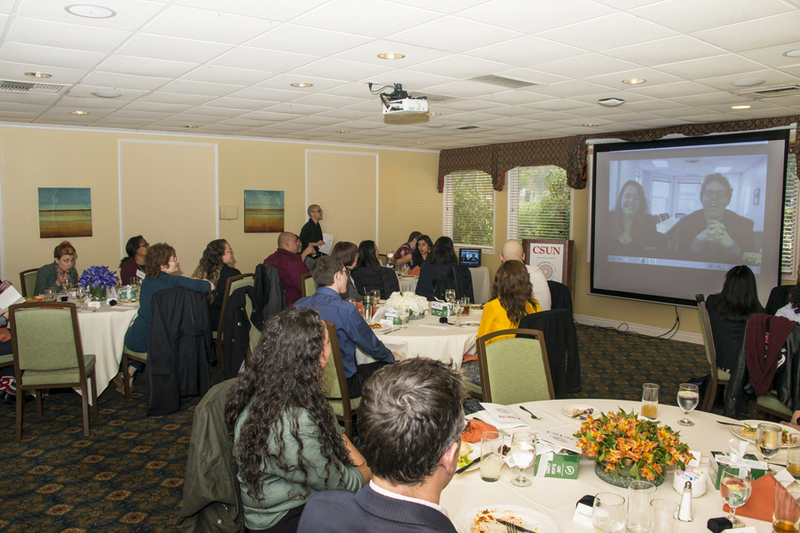 Members of the University of Pennsylvania Graduate School of Education's Center for Minority Serving Institutions, who have partnered with CSUN for this program, congratulate CSUN's first cohort through Skype. Photo by David Hawkins. 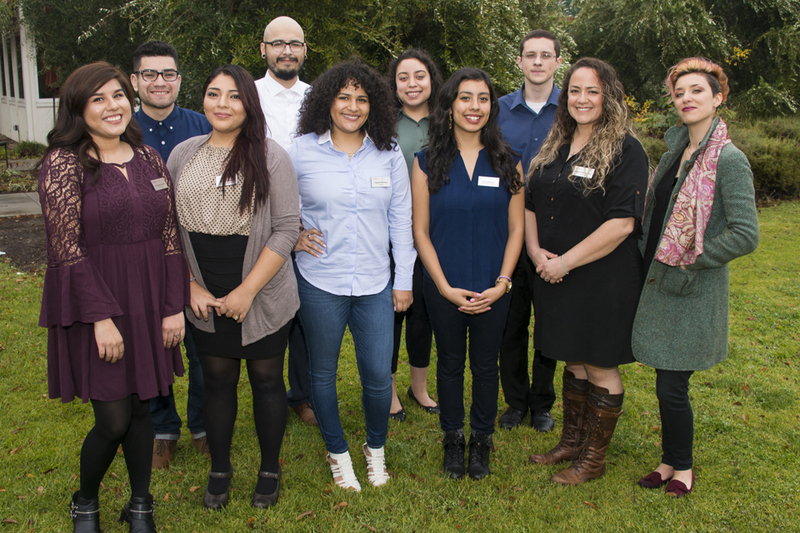 An excited, optimistic energy filled California State University, Northridge’s Orange Grove Bistro on Feb. 3 for the Hispanic Serving Institutions (HSI) Pathways to the Professoriate kick-off event. Ten CSUN juniors, who make up the program’s first cohort, took their first steps toward achieving their goal of earning their doctoral degree and becoming professors in the humanities and related fields. HSI Pathways is a program that aims to transform the landscape of the professoriate by increasing the presence and visibility of Latino and Latina faculty members, particularly in the field of humanities. At the event, students were introduced to their mentors — CSUN faculty who earned their doctoral degrees — who will give them insight into the challenges of obtaining a doctoral degree and becoming a professor, as well as personal advice on academics and careers. Mentors are invaluable to students on their path to a doctorate, participants said. The program will serve 30 CSUN students over the next five years. Throughout their journey, the first cohort will receive financial support for GRE preparation, application fees, trips to academic conferences — including an opportunity to present a research project at the University of Pennsylvania — and potential funding to begin doctoral research the summer after graduation from CSUN. While some of the 10 mentors were involved in similar mentor/mentee programs when they were undergraduates, many had to learn the ropes on their own. Alvarez’s mentee, Hermes Rocha, who is studying political philosophy, recognizes the importance of this program and said he is optimistic that the HSI program will be a crucial building block toward a career as a professor. For more information about the HSI Pathways program, visit here.